The end of this year is near, so it is time to prepare the garden for the upcoming growing season. Last month was the time of the year to dig up the soil and to remove withered plants. 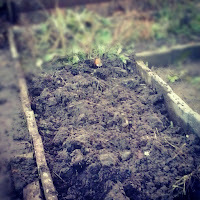 Yes, we were a little late, but luckily the soil wasn't too wet and not yet frozen. I prefer to work the ground with a pitchfork instead of a shovel; since the latter makes the work heavier, the ground stays in one hump and there is a bigger change to cut the valuable worms in two. Every scoop of ground I dug up in our garden had at least three earth-worms in it. Even though we love having them mixing and processing our soil throughout the year, it was also fun to see this little robin following me and eating a couple of our worms for lunch.